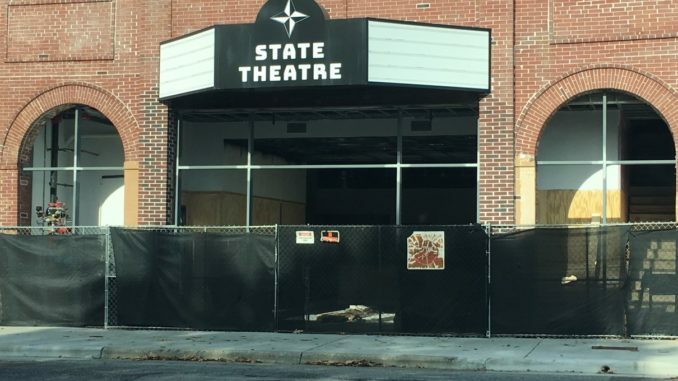 Don’t let the barricade fence, plywood wall panels, and lack of window panes fool you….the State Theatre will soon be open for business! Tickets are still on sale for the Whiskey Myers show, scheduled for just 13 days from now, so this hollow, construction-zone-like appearance is nothing to worry about! The State Theatre’s development hasn’t been without problems, as the opening has been delayed several times over the last few months. Shows that were scheduled from September to November have been canceled, or moved to other venues. According to Mr. Pearlman, tickets to upcoming shows will include a surcharge of $10 for hard hat rental.